← Feb 4, 2015: Preliminary report for Puccinia striifromis race analysis 2014 published by Global Rust Reference Center (GRRC), Aarhus University, Denmark. 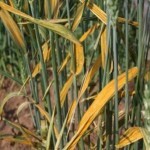 Favourable weather conditions for stripe rust are occurring across North Africa to South Asia. Cool, wet conditions across many parts of the region are producing a conducive environment for disease outbreaks. Aggressive races with virulence to Yr27 are known to be widely distributed in several countries and susceptible Yr27 carrying cultivars are still planted on large areas. In addition, the Warrior race (virulent on: Yr1,2,3,4,-,6,7,-,9,-,-,17,-,25,-,32,Sp,Avs,Amb) has spread into the region from Europe. Many of the resistant cultivars to the Yr27 race are likely to carry some of the genes defeated by the Warrior race, particularly in winter wheat material. After first detection in 2010, the Warrior race has spread rapidly across Europe. Most previously resistant cultivars became susceptible to this new race and widespread damage resulted in major European wheat growing areas. The Warrior race was confirmed in 2013 from Morocco, and subsequently in Algeria in 2014 (GRRC, Denmark) and Turkey in 2014 (Field Crops Research Institute, Ankara and Regional Cereal Rust Research Center, Izmir, Turkey). Under current conditions, this race is likely to spread in North Africa and the Middle East. The combined presence of the Yr27 aggressive race and the Warrior race may result in susceptibility of many existing spring and winter wheat cultivars. Although not recorded at present, acquisition of virulence for Yr27 by the Warrior race is not impossible and needs to be carefully monitored. Serious stripe rust outbreaks are now being reported from Morocco (March 2015), and outbreaks have occurred in India (Feb 2015 http://www.tribuneindia.com/news/haryana/yellow-rust-hits-wheat-over-2000-acres-in-y-nagar/47843.html). 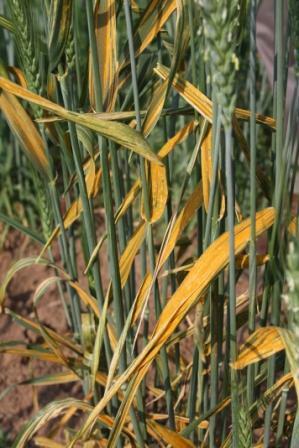 First reports of stripe rust appearance have also been reported from south-west Iran at the end of Feb 2015. Other countries e.g., Yemen currently only have low levels of disease or are currently reported to be disease free. Given the current and forecasted favourable weather conditions for disease development and the presence of the Yr27 aggressive race and the Warrior race, extreme caution and vigilance is advised with respect to stripe rust. Early detection, sampling, reporting and timely effective control of any outbreaks on susceptible cultivars is recommended. Reporting of new outbreaks to Borlaug Global Rust Initiative (BGRI) staff, K. Nazari (ICARDA) k.nazari@cgiar.org and D. Hodson (CIMMYT) d.hodson@cgiar.org is encouraged. Pathotype analysis of representative samples of stripe rust would provide additional information about which sources of resistances in wheat may be at particular risk. The Global Rust Reference Centre in Denmark may undertake such analysis, but only on a limited number of samples. Please contact K Nazari or D. Hodson for essential sampling and dispatching procedures.